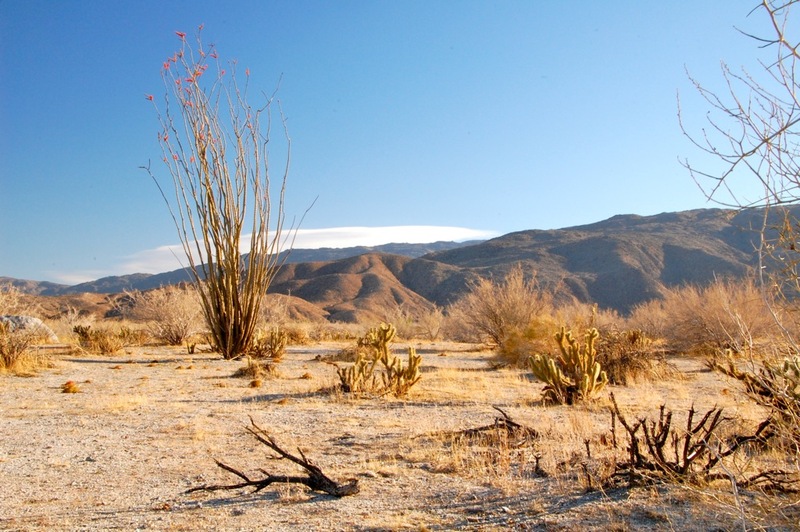 A fortnight before the vernal equinox we made way to return to Anza-Borrego Desert State Park, with hopes of seeing the beginnings of the spring wildflower season that in some years has been spectacular. 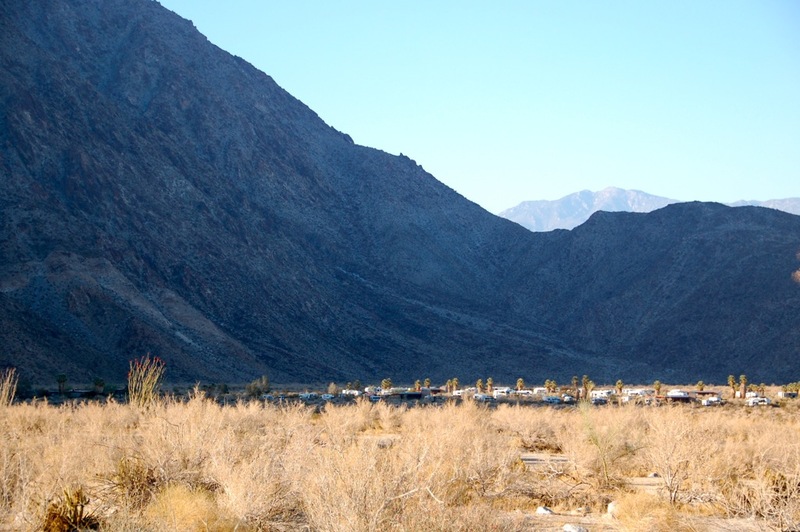 We arrived at Borrego Palm Canyon Campground just as the sun began dipping behind the nearby San Ysidro Mountains and shortly before a full moon began to rise in the early evening sky. A nearby Creosote Bush was just beginning to show some tiny yellow flowers as we nestled our Airstream Safari near cholla cacti and set up camp. 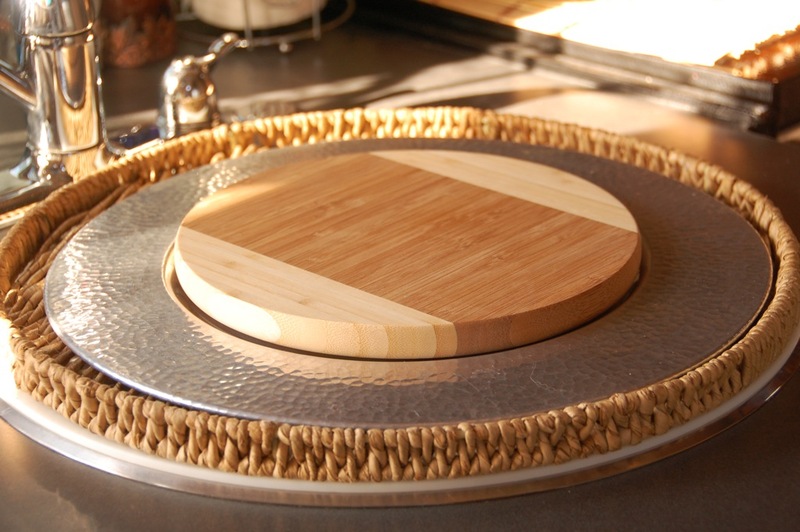 We now have a new addition for our galley, a 10″ round bamboo cutting board that fits nicely on the round aluminum platter that rests in a woven tray that sits on the white plastic cutting board/cover over our Lobster Sink. The bamboo cutting board was bought at an Asian market in San Diego. 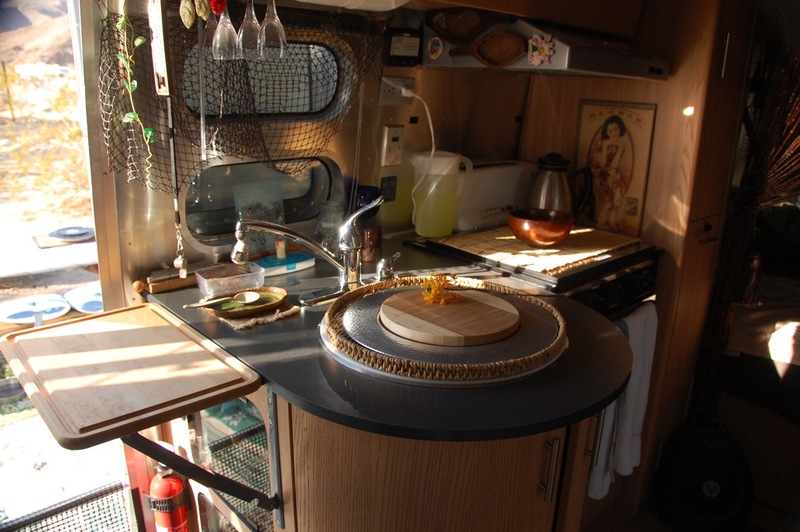 Our 23′ Safari has plenty of countertop space for us, especially when our 12″x18″ maple cutting board/counter extension (that we added) is raised and the Lobster Sink and stove are covered. As I walked out into the nearby desert, I noticed a dry landscape and a meager wildflower display due to lower than usual rainfall in the San Diego area since January. And when it does rain in San Diego, much of it is blocked from reaching our desert by our local mountains. 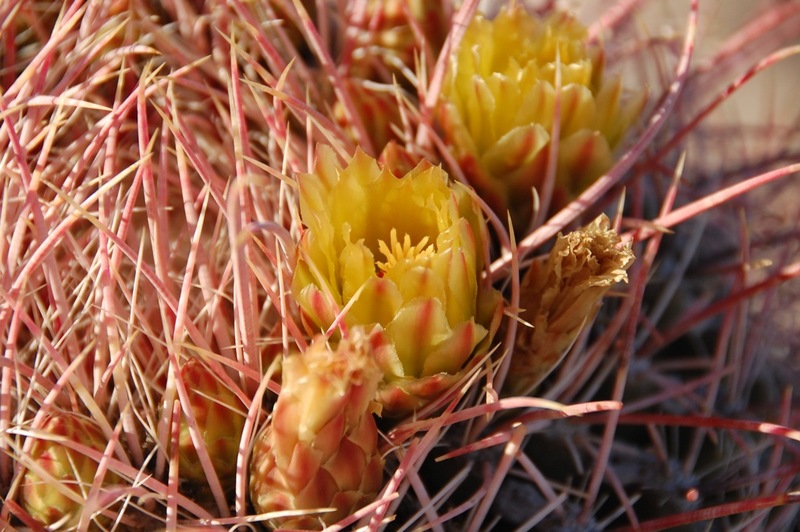 I did see sparse crimson flower buds on the tips of the shriveled, brown ocotillo stems seen above and yellow flowers of the barrel cactus seen below. Writer/photographer/Airstreamer Bert Gildart brought festive cheer with him when he arrived at our campsite on his bike. 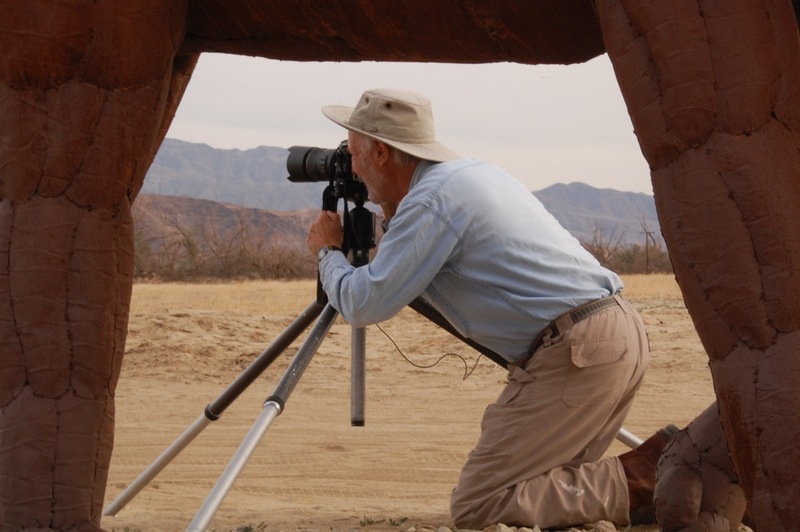 Bert and his wife, Janie, have been enjoying their winter stay in the Anza-Borrego Desert since December, and we have enjoyed linking up with them on our monthly trips here this winter. 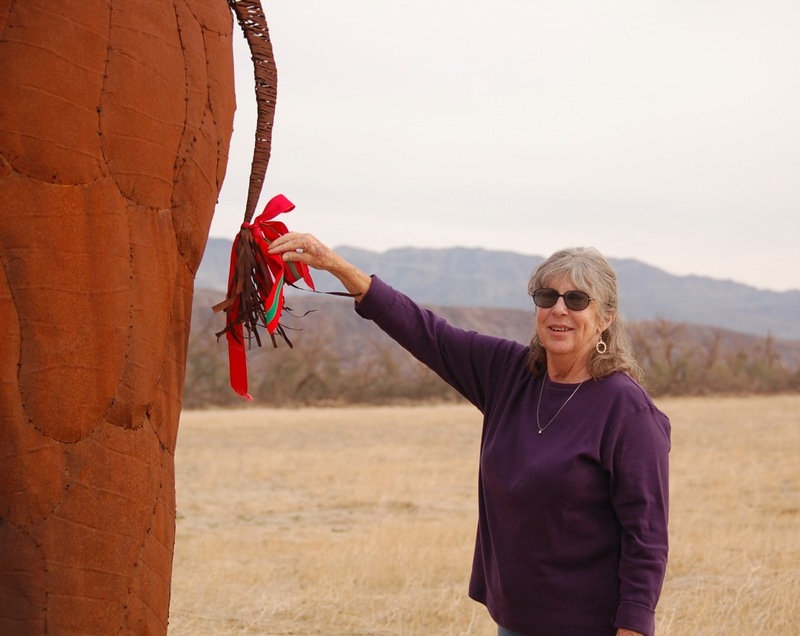 We have fond memories of sharing happy activities such as hiking, feasting, and pursuing bighorn sheep, along with photography, chatting, and sharing stories, books, information, and good times, including the pursuit of dragons! We had one more wonderful visit and brought lunch for Bert and Janie just after they pulled up stakes from Pegleg and moved their Airstream to The Springs at Borrego RV Resort, before they departed for the 4CU St. Patrick’s Day Rally. 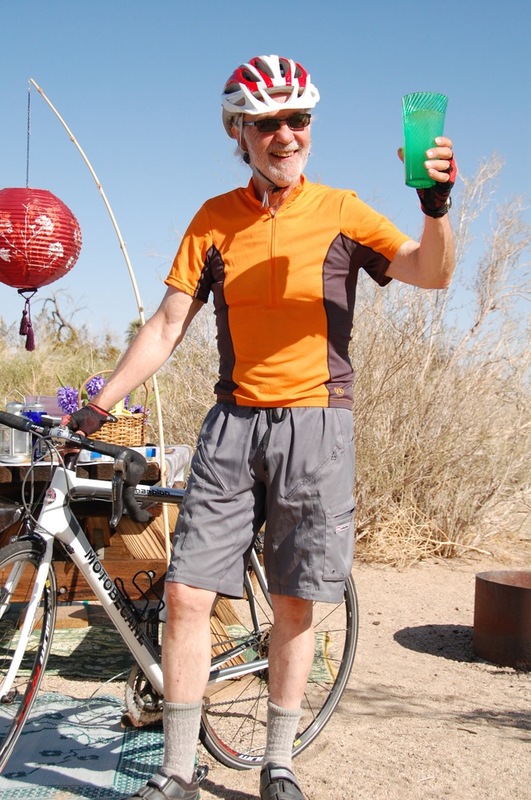 So we also raise our glasses high in a cheerful toast to Bert and Janie… and to hiking, bicycling, and spring! 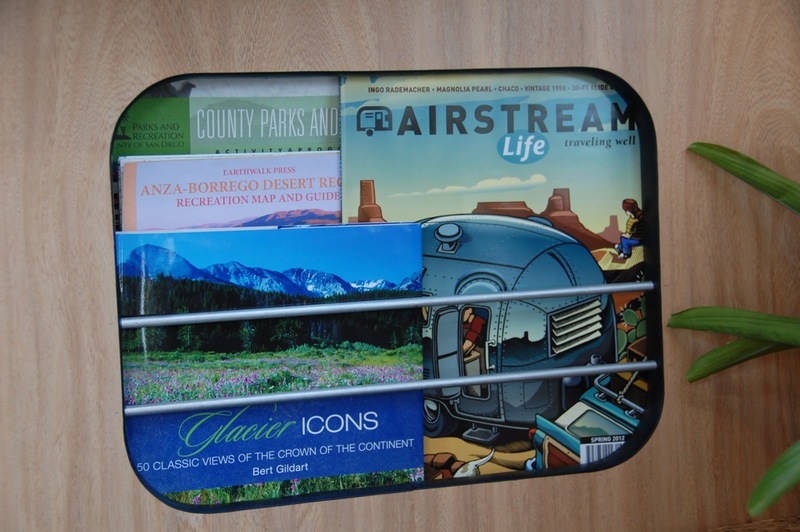 Just in time for spring reading, our Safari Airstream’s magazine rack now holds two new publications, Glacier Icons: 50 Classic Views of the Crown of the Continent, by Bert Gildart, and the “new and improved” Spring 2012 issue of Airstream Life magazine. Unfortunately, one of the most photographed glaciers in the park, Grinnell Glacier (named for George Bird Grinnell, influential in establishing Glacier National Park in 1910), is a disappearing icon. “According to Dr. Dan Fagre, Glacier’s climatologist, Grinnell Glacier could be the poster child for global warming… conditions are changing and that can best be appreciated by hiking to the Grinnell Overlook… from there, the panorama dramatizes the now-accelerated rate of global warming,” writes Bert on page 20. Listen to Dan Fagre as he talks about his mountain ecosystems research in Glacier National Park. Glacier National Park, with its thrilling Going-to-the-Sun Road, is included in Bert’s “Our Favorite National Parks” Airstream Life article, Spring 2011 issue. “I worked here in the late ’60s and ’70s as a seasonal ranger – and have returned almost every summer since then to hike,” wrote Bert in his article, “Glacier National Park – An Exploration of Glaciers, Bears, Sheep, and Tiny Pikas,” in the Spring 2006 issue of Airstream Life. The article covers Bert and Janie’s visit to Glacier National Park with their 28-foot Safari in the summer of 2005, where they joined a group hike on Grinnell Glacier Trail led by Dr. Dan Fagre, who pointed out the recession of Grinnell Glacier. 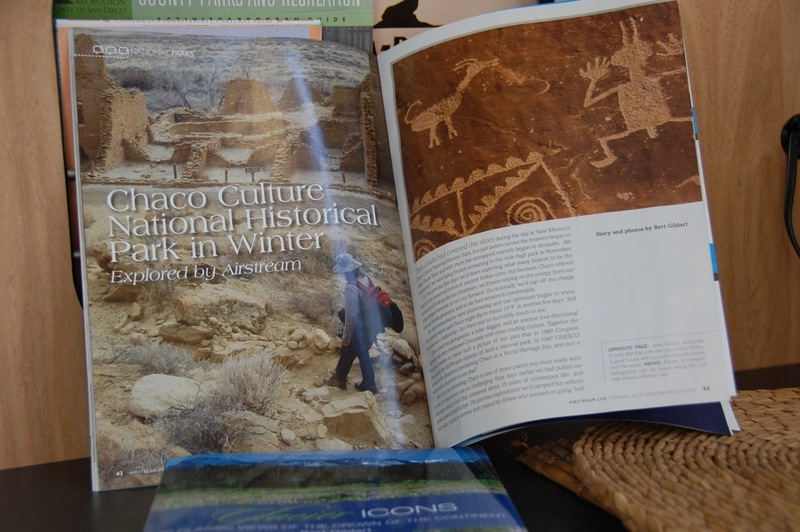 Bert’s stories and articles have appeared in most Airstream Life issues since the first one in 2004, including the current Spring 2012 issue that features his article, “Chaco Culture National Historical Park in Winter – Explored by Airstream.” This article covers Bert and Janie’s adventure into Chaco Culture National Historical Park in New Mexico in a brutally cold November, 2009, where they completely ran out of trailer power and generator gas as outside temperatures dipped to -11° F after midnight. According to Editor and Publisher Rich Luhr, starting with the Winter 2011 issue, Airstream Life has improved its readability by its choice of fonts, a “cleaner” article template, and more dramatic layouts with larger pictures. 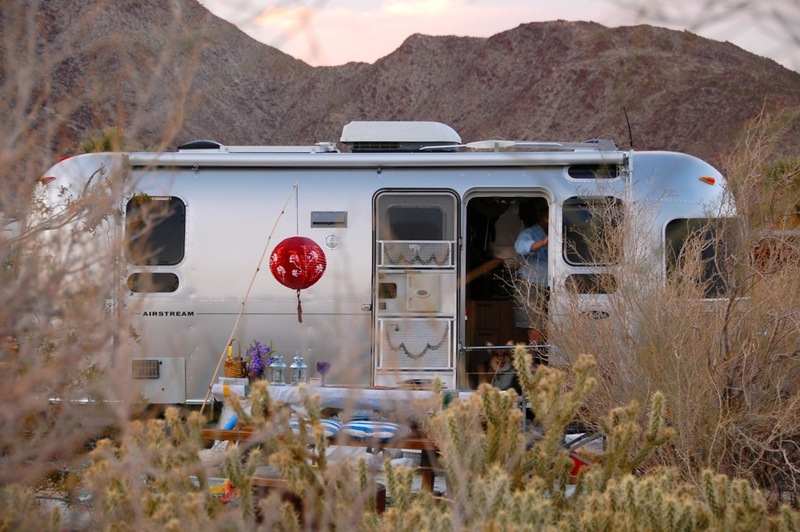 Airstream Life has a new feature, the “Buyer’s Guide”, which reviews specific Airstream models, and continues to feature quality articles such as those by Bert Gildart, with rich, poetic and majestic images.